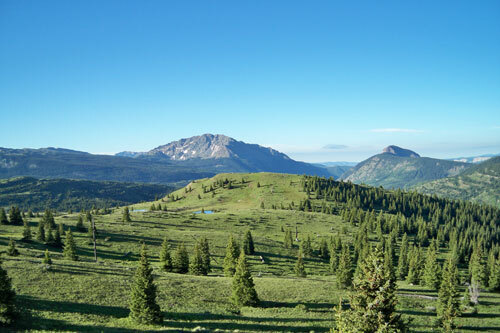 Continuing from my earlier posts on my experience in New Mexico and Vista Caballo, this entry details my experience the day that I left Vista Caballo and headed up into the San Juan National Forest for another adventure. I started the morning off with the group at Vista Caballo as we had breakfast and wished each other well on our respective trips home. Before I left, I had spoken to David and Bruce who know the area well to get some last minute advice from them. 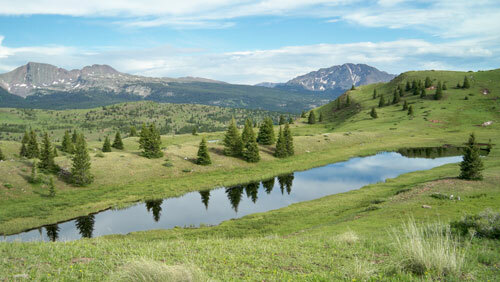 David had recommended that I check out Molas Pass – about 45 minutes north of Durango, so off I went. I checked in and got a map from the Forest Service visitor’s center in Durango before heading up to Molas pass. 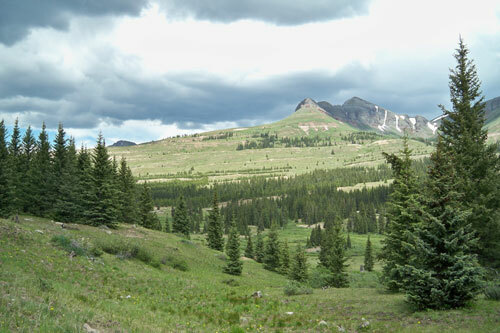 I arrived at Molas Pass (10,900 ft. in elevation) around 11am and gathered my things together and packed for the night. I remembered David and Bruce warning me about the weather and how storms can pop up quickly in the higher elevations. They told me that if it looked like the darker clouds were already forming, I shouldn’t go in. Well, the clouds were already forming, and I ignored the advice and went in anyway. I was very well aware of the risk I was taking, but decided I was ok with it. About half an hour into the hike, the storms were clearly visible and there was lightning popping up all around the area. Finally, my luck ran out and it opened up into a wet and windy snow shower. I hastily pitched my tent a few yards off the trail and rode out the passing storm. It’s interesting to me looking back on this video and how different my energy was compared to the first video in the Pecos Wilderness. Certainly, I was exhausted from a long weekend and a few miles of hiking at relatively higher elevations, but beyond that I found myself to be fairly contemplative after the experience at Vista Caballo. I was processing a lot of information, feelings, emotions, etc. and I supposed I needed some down time to let it all sink in. That’s exactly what I had that evening. I went to sleep early that night and slept fairly well at first. About halfway through the night I heard the sound of an animal calling out somewhere nearby. I didn’t recognize the call, but it sounded pretty big! My heart started racing as I played all sorts of doomsday scenarios in my head initially. As I was laying there imagining what this could possibly be, I was able to ground myself and remember that we are all connected, and this animal, whatever it was, was just doing what it normally did every night. I just happened to be there to hear it this particular night. There was a realization in there for me – it wasn’t about me. I was lucky enough to be a participant, but the fact that there was wildlife in the area did not mean that it was out to get me. Sounds funny, I know. The next morning I awoke to a beautiful sunrise and a gorgeous scene across the valley and onto the other ridge. I sat outside looking down toward the two small lakes, and I could tell that there was wildlife down there, but it was so far away that I couldn’t say for sure what they were. I’m guessing most of them were deer or perhaps elk, but I saw one of the larger animals wallowing around in a dark patch of soil right beside the lake. It seemed to be exhibiting behavior more in line with a bear than a deer. Of course, I’m no wildlife expert, and this might have just been a playful deer or elk. I was hoping to find out for sure, but I wasn’t about to go invade that scene with my curiosity. It was enough for me to witness it from a distance and hike out quietly in the other direction. This experience was definitely one that I will remember my whole life, and it provided many valuable lessons that I can apply to daily life back in the city. Perhaps most importantly is the enhanced awareness of the connectedness of all things, and the role we can play in our interactions with nature and with each other. I was just one participant in a much larger system during this experience, and by maintaining awareness, treading lightly and observing, I was able to be a part of it without exerting too much of my influence into the equation. I’m very thankful for this opportunity to be a part of this and learn, and I appreciate all the help and guidance I was given that made this experience everything it was.